We are reckoned among competitor exporters as the leading supplier of high quality chuck tender, which is in great demand in the market because of its softness and tender flesh. Also the product is rich in flavor and has high nutrient content. We make use of latest tools and modern machinery for processing the meat products with complete adherence to hygiene and sanitary regulations set for this industry. We make available the chuck tender in various preferred sizes and shapes at very reasonable prices. We provide to our clients high end Cube Roll that are processed keeping in mind the market norms. The Cube Roll we produce and deliver are prepared very hygienically and quality checked at different stages of processing. We make sure that only quality tested Cube Roll is delivered in the market at industry leading rates. We offer to our clients a wide range of superior quality rum meat that is widely made use of to make rump steak, rum roasts and corning. Rump meat we offer is rich in nutrition, tender and tasty to eat. We process rump meat in a very clean and hygienic condition and keep stock of it in cold storage units. We ensure that our rump meat does not have any artificial preservatives which help to enhance its shelf life. We offer a wide range of our brisket frozen meats that is in high demand for its immaculate quality and delicious taste. These brisket frozen meats are processed in a hygienic environment and sealed and packed to make sure and retain their freshness. We are widely acclaimed for our range of products for their awesome taste and good flavor. Brisket frozen meats extended by us are very soft and can be easily cooked. Our products are made available in market at reasonable rates. 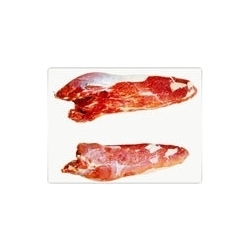 Our range of Top Side meat is hygienically processed and has natural color and taste. This product has lesser level of cholesterol and is an efficient source of nutrients. Supplied in vacuum packagings, our meat is very tender and delicious. Sourced from reputed vendors, and processed and tested for quality parameters, our Buffalo meat has longer shelf life. We provide good quality Silver Side Meat also.